This continues to be a very busy event season for us, with tastings and seminars planned right up until the holidays. 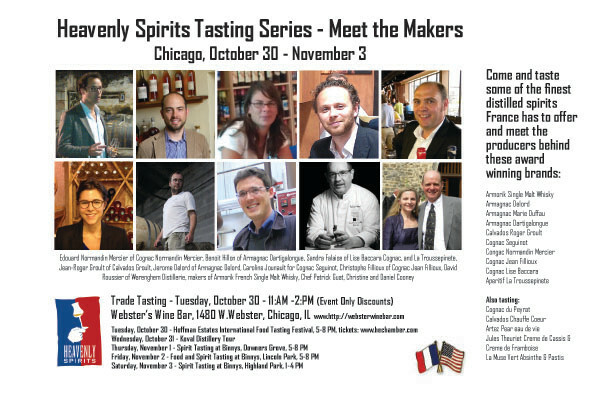 In addition to events in Rhode Island, New York and Massachusetts, we are looking forward to our most ambitious event to date, and that is our first ever Meet the Makers Tour which will encompass five days in Chicago with eight of our producers traveling around with us to different venues each day to offer tastings and talk about their award winning artisanal French spirits. We hope that anyone in the Chicago area who is reading this will take advantage of this wonderful opportunity to come out and learn about the fascinating art of distillation from the artists themselves. For more information, see our events page. The week of Heavenly Spirits tastings begins appropriately at the Hoffman Estates’ first ever International Food Tasting Festival on Tuesday, October 30. http://cloud.chambermaster.com/userfiles/UserFiles/chambers/495/File/TasteofHoffman-4.pdf. The Festival will be featuring the culinary masterpieces of French Chef Patrick Guat and his students from the Culinary School of L’Amandier, Angouleme, France who will be serving a variety of specially prepared appetizers and delicacies brought over from the southwest region of France. A maximum of 300 people are allowed into this event and the $10 advanced tickets are expected to sell out fast. Attendees will have the opportunity to talk with the distillers and producers and to sample a variety of French spirits both neat and in a variety of cocktails. On Wednesday, the Heavenly Spirits gang has been invited to tour the Chicago based Koval Distillery, while later that evening, All Hallows Eve, the visiting French distillers will get a chance to explore Chicago’s night life, on their own at its wildest. Returning to the tasting circuit on Thursday, the group will be offering tastings and information at Binnys’ Downers Grove location from 5 – 8 PM. The Friday night tasting is not to be missed; from 5 – 8 PM Chef Patrick Guat will rejoin the Heavenly Spirits group at Binny’s most popular spirits retail outlet, Lincoln Park, Chicago. In addition to the multiple tables of French artisanal spirits that will be available for tasting with the producers, the public will be treated to more genuine culinary treats from the Southwest of France prepared by Chef Guat and his visiting crew of student chefs (while supplies last). Finally on Saturday night, November 3, you will find the Heavenly Spirits’ tasting crew at the Highland Park Binny's from 5 – 8 PM for its final Chicago tasting appearance. Drinks industry trade journalists are encouraged to contact Dan Cooney (508 947-9973) well in advance to schedule interviews with these Master distillers during their brief visit to the windy city.